Despite Argentinian Victory; Sampaoli's Selections and Substitutions Baffles Everyone! Argentina pulled out the 'Miracle of the Tournament' with a late goal from Marcos Rojo, which take them to the knock-out stage of 2018 FIFA World Cup. An entire nation, their fans across the World and the Players all breathing a sigh of relief after Argentina pulled out a late victory to prevent getting eliminated from FIFA World Cup 2018. 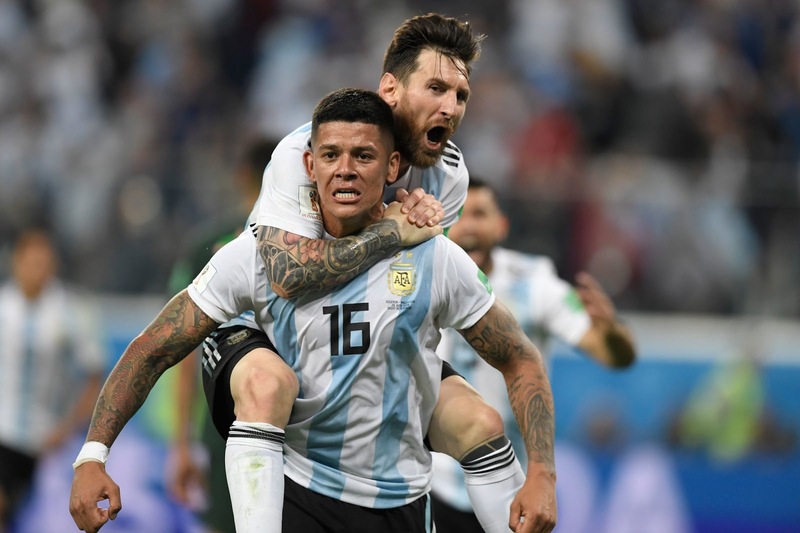 It took a late goal from an unlikely candidate, Marcos Rojo and like many pundits pointed out with a strike from his weaker foot; to take Argentina through. Lionel Messi earlier put Argentina in the lead in first half; but a second half penalty given away by Mascherano tied thetally for Nigeria. Like earlier matches, Sampaoli created a bit of furore with his selection for staring line-up. The choice of 4-3-3 formation may not be debated but I would have preferred Argentina playing a 4-2-3-1 formation and we saw the problems with 4-3-3 once the qualizer came in. But what baffled everyone, was the presence of Enzo Perez in the line-up. What was he doing in the line-up, only Sampaoli and god knows! Angel Di Maria should not Start for Argentina Anymore! I even had a problem with Di Maria's presence in the line-up. I clearly pitched for Pavon to be included in the line-up and we saw the speed he brought into the game after the substitution. For some reason Di Maria's perfromance in this tournament baffles me. He have no idea what is he doing; it appears he leaves his brain in the locker room before he steps on the field. Apart from an impact substitution, I don't see any benefit in starting with him. Despite all these, it was easy to understand why Sampaoli chose to start with Angel Di Maria. In such a crunch match, it would be risky not to start with such an experienced player. But the presence of Perez baffled everyone. Especially he came in as a late addition to the squad and also Salvio did decently well in the earlier match. And his performance proved us right to a greater extent. Higuain who started courtesy of Aguero's presence in the Croatia match never did anything to make a claim for the starting line-up. I would be surprised to see Aguero on the bench in next match as he was so intelligent in making runs and creating spaces after he came in. If you get time to watxh the replay you will understand how his runs created space for Rojo for the winner and for an earlier chance for Higuain. If Sampaoli's starting choices confused you, then you felt tearing him apart by his substitution choices in the begining. When the team needed a winner, for some reason he thought Mezza instead of Aguero should be brought in. He never brought in Aguero until the clock hit 80 minutes. That's criminal; Aguero is the World's leading striker and his goal against Iceland was alone to bring him early in second half. And what did Sampaoli's first choice Mezza do - he couldn't even control the ball. I wonder what would be Dybala thinking with Sampaoli's choice of substitutions. The introduction of Mezza started the total confusion, and you could see all players were getting in each others way. If these kind of things continue, Argentina could be on way home soon. Despite all this, there were some decent performances. Mascherano who struggled a bit, acted like a leader for most of time. he is at the wrong end of thirty and it would make some sense to give him a bit of cover with a double pivot against France. taht could be crucial in deciding the fate of that match. I still believe they need to return to a 4-2-3-1 formation against France to have any decent chance. France will definitely start as favourite, but that's a good thing because it would give them some space to play. And if Lionel Messi is afforded some space, then he could work his magic. But for that the defense needs to play a solid match!